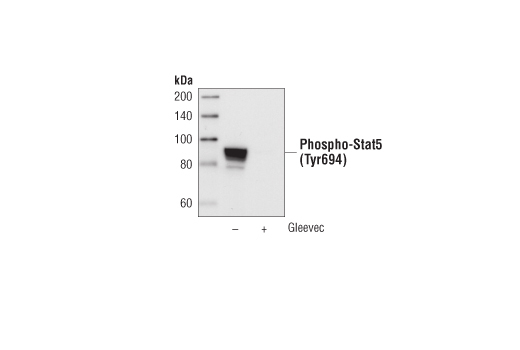 Western blot analysis of extracts from K562 cells, untreated or treated with Gleevec, using Phospho-Stat5 (Tyr694) (C11C5) Rabbit mAb. Immunohistochemical analysis of paraffin-embedded human breast carcinoma using Phospho-Stat5 (Tyr694) (C11C5) Rabbit mAb. Flow cytometric analysis of K562 cells, untreated (green) or STI571-treated (blue) using Phospho-Stat5 (Tyr694) (C11C5) Rabbit mAb. 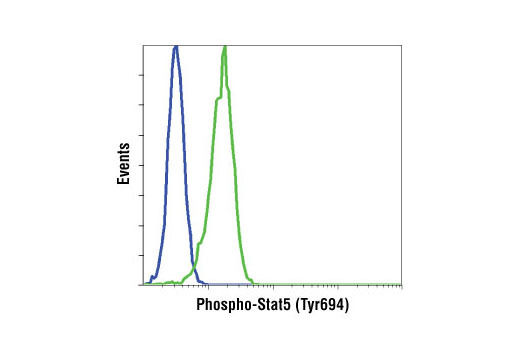 Phospho-Stat5 (Tyr694) (C11C5) Rabbit mAb detects endogenous levels of Stat5a only when phosphorylated at Tyr694 and Stat5b when phosphorylated at Tyr699. Monoclonal antibody is produced by immunizing animals with a synthetic peptide corresponding to residues surrounding Tyr694 of Stat5a. Stat5 is activated in response to a wide variety of ligands including IL-2, GM-CSF, growth hormone and prolactin. Phosphorylation at Tyr694 is obligatory for Stat5 activation (1,2). This phosphorylation is mediated by Src upon erythropoietin stimulation (3). Stat5 is constitutively active in some leukemic cell types (4). Phosphorylated Stat5 is found in some endothelial cells treated with IL-3, which suggests its involvement in angiogenesis and cell motility (5). Stat5a and Stat5b are independently regulated and activated in various cell types. For instance, interferon treatment predominantly activates Stat5a in U-937 cells and Stat5b in HeLa cells (6). Gouilleux, F. et al. (1994) EMBO J 13, 4361-9. Wakao, H. et al. (1994) EMBO J 13, 2182-91. Okutani, Y. et al. (2001) Oncogene 20, 6643-50. Demoulin, J.B. et al. (1999) J Biol Chem 274, 25855-61. Dentelli, P. et al. (1999) J Immunol 163, 2151-9. Meinke, A. et al. (1996) Mol Cell Biol 16, 6937-44.